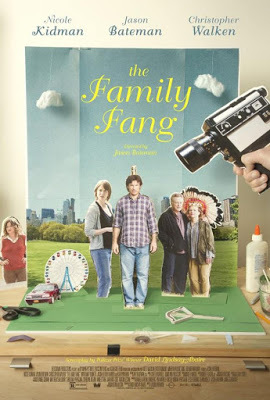 “The Family Fang” (2016). Cast: Justin Bateman, Nicole Kidman, Christopher Walken, Maryann Plunkett, Kathryn Hahn, Harris Yulin, Jason Butler Harner, Mackenzie Brooke Smith, Taylor Rose, Jack McCarthy, Kyle Donnery, Marin Ireland, Linda Emond, Grainger Hines, Frank Harts, Edward Mitchell, Patrick Mitchell. Director: Justin Batemen. Screenplay: David Lindsay-Abaire. Book: Kevin Wilson, The Family Fang. Web site. Trailer. Our parents always have our best interests at heart, right? Are you sure? What if they have agendas riddled with unusual, self-serving plans and schemes? What kind of impact would such undertakings have on impressionable young minds? Would the effects be detrimental or beneficial (or possibly both)? Questions like these are at the core of the offbeat comedy-drama-mystery, “The Family Fang,” now available on DVD and video on demand. Caleb and Camille were thrilled by their children’s contributions. In fact, they soon came to realize that the kids were what made their projects work. And, while it seemed they truly adored Annie and Baxter, there was some genuine doubt amongst spectators – and eventually the kids themselves – whether Caleb and Camille regarded them as bona fide family members or as mere extras in their productions. This became especially apparent when Annie and Baxter were teens (Taylor Rose, Kyle Donnery), when they became part of a project in which they themselves were played for fools, an incident that prompted the schism between children and parents. Needless to say, Annie and Baxter refuse, prompting an argument between them and their parents. Caleb and Camille decide to go away for a few days to cool off, but, while gone, their car is found abandoned and covered in blood. Police authorities (Grainger Hines, Frank Harts) are worried, given that this discovery has occurred in an area where similar incidents have taken place. The kids, meanwhile, pay little heed to these cautions, believing that this is just their parents’ latest stunt. The question is, though, how can they prove it? Performance art, by its nature, frequently pushes the boundaries of what most people consider art. Limits are routinely exceeded, and results seldom mimic anything previously tried. Those who engage in it, like Caleb and Camille, often argue that its controversial nature is intended to encourage discussion about the very character of art, as well as whatever subject matter it incorporates and what points it seeks to make. In many regards, performance art embodies the notion of exceeding limitations, one of the core principles of conscious creation, the philosophy that maintains we manifest the reality we experience through the power of our thoughts, beliefs and intents. And, based on their works, Caleb and Camille are certainly expert at that. Admittedly, some of what they do is purely for shock value, but it nevertheless gets people talking and thinking about the topics at hand and what innately constitutes art. Because of that, their creative efforts not only set an example for their field of endeavor, but it also provides inspiration that transcends the world of art, employing underlying principles applicable to any type of undertaking, especially where the pushing of boundaries is concerned. When it comes to such innovations, one might wonder where the ideas for them come from, but the answer is simple: Like any type of manifestation, the impetus comes from one’s beliefs. They provide the juice that makes the process work. Those who are expert at envisioning outcomes and crafting the beliefs that put them into motion are most adept at realizing such materializations. This is true both in terms of the creations themselves and the ideas that they’re metaphorically meant to reflect. Pushing the envelope, of course, sometimes raises the question, “How far is too far?” When onlookers witness children engaging in what many would consider questionable acts, eyebrows naturally get raised. Are those kids willing participants, or are they being exploited by adults with self-serving agendas? What impact will those experiences have on the youngsters, and how will it affect their futures? As “The Family Fang” illustrates, however, the answers to those questions may not be as clear-cut as one might initially think. Would Annie and Baxter have even considered careers in the arts were it not for their childhood experiences? Moreover, given the nature of their parents’ projects, isn’t it possible that such horizon-stretching exercises might eventually help them push the limits of their own creativity? Couldn’t it be that their parents are, in their own backhanded way, helping to give them a push in the development of their art and careers? Sometimes we have to dig deeper, past surface trappings, to see the true underlying intents involved. And there’s no telling what unexpectedly remarkable outcomes might arise from that. One might be especially suspect when parents are involved. Some would be shocked at how they could do such things to their own children. But, if there’s no form of abuse involved and the aforementioned stellar results emerge, is it really fair to question the parents’ motives? Isn’t it possible that such acts, bizarre though they may be, are actually intended to help the kids in the long run? And isn’t that one of the most loving acts that parents can engage in for their children? Again, the superficial aspects of these scenarios may not tell the whole story, and spectators – indeed, sometimes even participants – might have to look past such considerations to see what underlying beliefs are truly at work here. “The Family Fang” is a wickedly funny, somewhat ghoulish offering that’s fresh in virtually every regard. With an excellent cast, an engaging narrative that continually keeps viewers guessing and a deliciously twisted sense of humor, this underrated indie production pushes a lot of buttons about what we should expect out of art and our parents. This offering certainly won’t appeal to everyone, but, for those who enjoy cinema that pushes the envelope, this one is definitely for you. The next time you find someone’s motives suspect, stop and take a good, hard look at what’s involved. You might be surprised at what you discover, especially when delving beneath the surface of the situation to see what lies below. There’s often more than meets the eye in scenarios such as this, and the hidden gems that lie therein may ultimately prove to be worth their weight in gold. This one is a must see for me, Brent. Justin Bateman is developing into a compelling talent behind the camera as well as in front of it. Your reviews are consistently thoughtful and robust. Keep up the great work.